This urban Cape Cod-style house needed some love. Its location -- a corner lot across the street from a popular park -- means there is considerable foot traffic on two sides of the house. The main entrance of the home, located close to the sidewalk, leaves little room for delineating between public and private spaces. The existing landscape was unremarkable. It was typical of many older homes, planted at random intervals and without an overall cohesive plan. The lackluster design coupled with a harsh southern exposure left the simple house looking cheerless and unwelcoming. The homeowner loved the bustling activity of her neighborhood, but she also wanted to carve out some privacy. She also wished to showcase her home’s elegance and surround herself in beauty. The challenge for our Phillips Garden design team was to define both public and private spaces in a tight space while still maintaining a connection with passers-by. We also wanted to bring more overall structure and elegance to the landscape, highlighting the classic style and integrity of the home. Another main focus was making the front entry more inviting. This home's modesty is the perfect backdrop for cottage-style gardens, which both soften the house’s minimal style and add to its gracefulness. The green "wall" welcomes while also creating a feeling of removal from the sidewalk. From certain viewpoints, the yard flows seamlessly into the adjacent park. 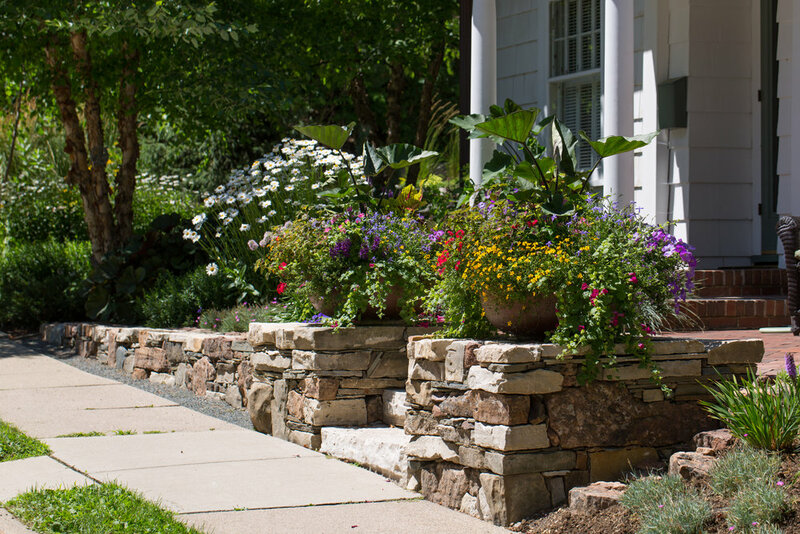 The bench-like height of the wall also serves as an invitation to neighbors and pedestrians to briefly stop, rest, and enjoy the beautiful gardens. The homeowner also valued her truly private space at the back of the house as a place to relax and recharge. However, this space was originally unwelcoming and isolated from the rest of the yard. Our designers expanded the front perennial plantings, using a continuous garden border to fill in where the grass had been struggling to survive anyway. Pathways and gardens now surround the entire house, creating well-defined privacy and continuity throughout the outdoor spaces without shutting out the neighborhood. Private and public spaces are created with one unifying design that showcases this beautiful property.